Danish knot is this week’s stitch on Sunday Stitch School challenge by Queenie. The working of the stitch in here on her blog. On TAST challenge I had worked Palestrina knot. That is linear stitch. Danish knots are individual version. Still it is hard to acquire the right and uniform tension to work these knots. I worked these samples in anchor perle cotton #8. Started the sampler with the basic version of Danish knots. The second row is the compressed version of the knot. In the third the first two versions are alternated. In the first row, the first insertion is worked longer than the second one. The needle goes into the fabric after the completion of the knot one hole closer than the earlier one. The knot is snug and has a tail. In the second row, the main stitch is wider than normal, and it is also pulled down when working the knot. This stitch looks like knotted fly stitch. In these rows two Danish knots are worked together in two ways. I like the way these knots are worked in the second row. Gives scope for embroidery designing. The first row in this part of the sampler is the zigzag working of Danish knots. After this Danish knots are combined with other stitches. Detached chin stitch in the second row, over feather stitches in the third row, with fly stitches in the fourth row. With these samples this sampler is completed. There must be some way of working these knots better. May be using other threads- perle cotton# 5 or more, more strands of cotton skein or with wool. It could be lack of my expertise or needing more practice. RPW 2016 chart of the week was completed on Saturday. 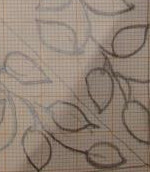 This week’s stitch on Sunday Stitch School challenge is Danish knot stitch. I want work the samples as a band sampler. 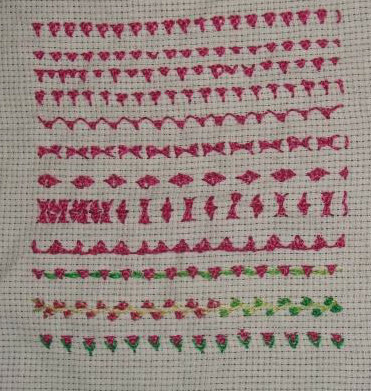 Still in the process of thinking on this sampler. TAST 2016 week’s stitch is Twisted lattice band. The samples were worked in 2014. The link to the details was posted on Pintangle and TAST FB group. After completing the pattern in yellow thread, I started with light green thread. Copper mangalagiri tunic has bead work along the border and is now ready to wear. 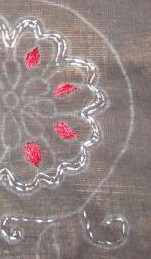 A design was drawn for embroidery on a string bag. The idea for this embroidery was from Mary’s Needle and thread blog. I also picked up the kantha work on black fabric for maroon black ikat tunic. This tunic with printed chanderi fabric on the neck, hem and sleeves came from the tailor. This project needs a small motif to be worked below the neck. Now to start the Danish knot sampler.